But a lot of work led up to these epic 1961 and 1962 flights, as the new PBS documentary "Space Men" makes clear. And this work was done not just by test pilots in jets, but by brave balloonists, the film reveals. You can see an exclusive clip from "Space Men" here. "It was just this kind of forgotten history, and then I was drawn into that," Amanda Pollak, the documentary's writer and director, told Space.com. "In the late 1940s and '50s, he [Stapp] saw the progress around him and what was happening with rocket technology. As a med doctor, he saw people flying faster and higher, and he wanted to protect the human body in that situation." "The purpose of Manhigh was to come up with the life-support systems," said retired U.S. Air Force Col. Joseph Kittinger, who flew one flight in 1959 during Manhigh and three times during Excelsior, in 1959 and 1960. Kittinger said the challenge was to come up with a bailing-out system simple enough for anyone to use. "Pilots aren't skydivers," he said. For example, one problem is rotation: When jumping out of a plane, a skydiver will start to rotate. At low altitudes, this isn't a problem, because air resistance keeps the spin rate down. But at the altitudes Kittinger jumped from, there is so little air that the rotation keeps getting faster — as he discovered on his second jump, in November 1959, when a parachute malfunction resulted in a spin of 120 rotations per minute that knocked him unconscious. 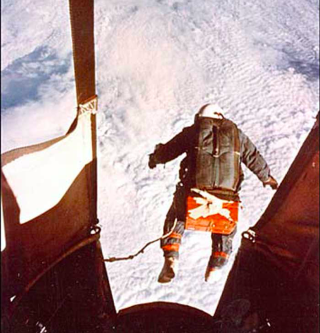 Kittinger's emergency chute opened up at about 10,000 feet (3,000 m), saving his life. The result of Kittinger's jumps, though, was the drogue parachute design that spacecraft still use today — a small parachute is released at high altitude, when the spacecraft has built up enough speed for the thin air to catch it. That smaller parachute guides the larger one, which is opened later, and prevents tangling. Stapp's project also gave engineers the equipment that they almost take for granted in astronaut training today, such as the centrifuge that subjects test pilots and astronauts to high gravity loads. Beyond testing the limits of human bodies, there were scientific experiments to be done. In the 1950s, not much was known about the region beyond the stratosphere. It wasn't clear, for example, how dangerous superenergetic cosmic rays might be to human health. Pollak said politics likely played a role in the balloon projects' demise. The Dwight Eisenhower administration wanted NASA to be an entirely civilian program, so the associations with the U.S. Air Force were downplayed. It was also difficult to get the public excited about balloons when rockets were on offer. Meanwhile, Kittinger, who still flies planes and performed the first balloon trans-Atlantic crossing in 1983, says he'd do his jumps all over again. "I'd need a bigger pressure suit," he said.